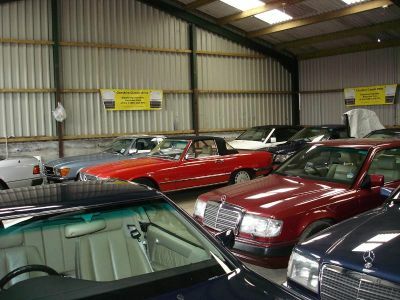 Thanks to recent expansion of our premises we can once again offer secure covered storage for your classic or prestige car (or boat, caravan, motorhome, lorry, bus, horsebox etc) at very competitive rates. This can be over winter for your classic car, or for just a few weeks for your modern car while you are out of the country on business or vacation. Our main business involves us caring for valuable classic cars, so you can be sure that your car will receive the best attention while it is with us, regardless of whether it is classic or modern. We can drop you and pick you up at Manchester Airport, which is only 10 minutes drive from us, or Macclesfield/Wilmslow rail stations which are 1hr 41min from London and 22min from Manchester. If you want to store a vehicle on a semi-permanent basis due to lack of space at home, but want to use it occasionally, we can provide access at fairly short notice for pick up and drop off. We are in a rural location in the Cheshire Countryside between Macclesfield and Wilmslow, with the owner living on site within 20 yards of the storage buildings, and are conveniently situated for residents of Greater Manchester, Stockport and Cheshire. Prices start at £18 + VAT per week for basic storage including dust cover, and a full range of care and exercise options is available for vehicles in longer term storage. Please ask for a full price list. Thanks for looking after my car. It’s important to me and it gives peace of mind to know that it’s being properly looked after in secure dry conditions by competent people. I will always recommend you. An email we recently received from Ray S of Stockport after we had stored his Rolls-Royce Silver Shadow.